The idea is to propel your smaller counters onto the board by using the bigger ones to press and flick the little counters. You then keep track of the score depending on which number your counter falls on. Any counters which fall into the wooden cup in the centre can not be used in the next round. The first person to 100 points is the winner. This retro set has full instructions, plastic counters and a wooden cup. 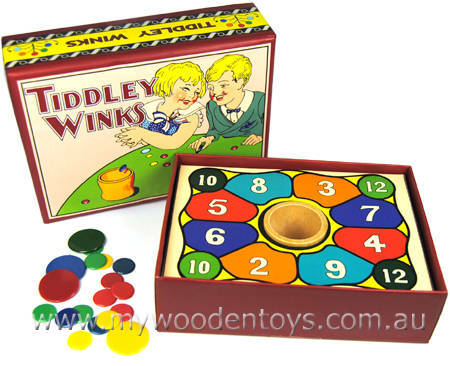 Interestingly this traditional game has the Victorian spelling of Tiddley Winks on the box. The box and board is make from strong high quality card. Material: Wood, Carboard, plastic counters. We like this because: "Sweet simple game beautifully presented."